Flint's attempt at a theme park back in the 1980s. Autoworld opened on July 4, 1984, then closed six months later due to poor attendance. It was closed for good in 1994, then demolished in 1997. Indians acquire Andrew Miller for prospects Tribe also trades for Jonathan Lucroy (pending his approval) Wow, Cleveland's been busy on deadline day. Jim Price: "Alright, gang, I spoke with The Great Al Kaline in Roseville yesterday about Verlander's Arsenal and The Art of Pitching. Wow, nice area." That sums up Jim Price's commentating. You could get hammered by the "Thiiiiiiiiirrrrrd" inning if you had a shot each time Price used one of his favorite lines. He was even worse as middle innings announcer. Jim Brandstatter: Okay commentator, horrible as announcer. He was lost last season. Awful move by Michigan. Dan Miller: Goes from mediocre homer announcer to shameless cheerleader ("STAND UP FORD FIELD!!!! STAND UP!!!!! "), depending on how the game is going. Big downgrade from Mark Champion. The Flint Generals in the early 2000s had a great look. Peoria Prancers (IHL)--With that logo, the team could have been called the Bucks, Stags or even Chargers. Logo kind of looks like something you would find on a lawnmower. Port Huron Beacons (UHL)--Was expecting the team to be called the Flags. Never cared for this nickname or the logo for that matter. Dayton Demonz (FHL)--Don't have very high expectations for the FHL, but spelling a plural word with a "z" at the end sounds like late 1990s ECW. Danbury Trashers (UHL) Port Huron North Americans (Major League Roller Hockey)--They didn't last too long and ended up moving to Flint midway through their only season. 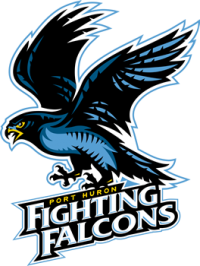 I didn't care for the name "Port Huron Fighting Falcons" at first. It grew on me, but I would still just drop the "Fighting" part of their nickname. At first I thought it was inevitable, but now I doubt they go with Flint Tropics. IMS Hockey (team owners) wants a nickname that will be marketable for many years and something the community can rally behind. Flint Tropics would have an initial surge in apparel sales and media attention. But once that wears off, all you'll have left is a team with a joke nickname. Plus, while Tropics was popular in the name-the-team contest, a lot of the pro-Tropics votes were from outside of Flint. I'm not hearing too many hockey fans around the Flint area that like that name.My guess is they go with Flint Phoenix, though I would prefer Flint Arrows or Firebirds. I've seen Tigers games in the last few years of Tiger Stadium that had about 12-16,000 in attendance. Also, I've been to a lot of Fighting Falcons games over the past few years that had about 400-500 at McMorran Arena (a 3400-seat arena for hockey). That .gif reminds me of the Tigers' bullpen and offense this season. 2007 Motor City Bowl, Central Michigan vs. Purdue. Purdue was up 34-13 at the half, looked like it was over. CMU scored 28 points in the third and eventually tied the game at 48 late in the fourth. Purdue won on a last-second field goal, but it was still a thriller. Detroit Lions: Continue to stumble along as an also-ran franchise. Make the playoffs now and then, but no Super Bowls. Detroit Tigers: Remain the top team in the AL Central for several more years, making it to 2 more World Series, winning once. Detroit Red Wings: Franchise continues descent to middle-of-pack team as rebuild/"We like this team, as is.." continues. No Stanley Cups, but the playoff streak continues. Detroit Pistons: Pistons get even worse the first few years as the rebuild continues, but they should be back on track by 2018. CMU Football: Dan Enos fired as coach as program continues to stumble. Port Huron: McMorran Arena is renovated, and Port Huron gets yet another hockey team, this time in the USHL. Arena football comes and goes. Saginaw Spirit: Win their first OHL championship. Pittsburgh Steelers: Two more Super Bowl appearances, winning once. Toronto Maple Leafs: Make it to the Stanley Cup Finals, but lose.